Looking for christian books? Biblio.co.nz hosts hundreds of of the finest online book stores and booksellers, including specialists in christian books. Use the list below to locate a specific specialist bookseller or book store near you. Or, use the form below to search the inventory of all booksellers who specialize in christian books. We are a Christian Bookshop offering books and Bibles for adults and children together with gifts, greetings cards, cds and dvds. Bookstalls can be provided for Conferences and other outside events. We also search for out of print titles. Do let us know how we can help you. 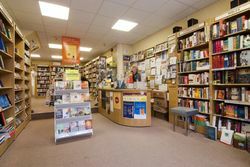 Christian bookshop in Newbury, UK, specialising in Christian books, DVDs, CDs and gifts. We also have a dedicated gluten-free cafe attached.